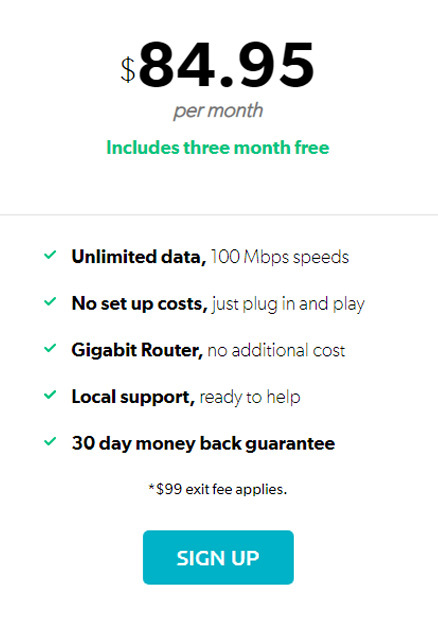 This is an amazing limited time offer from Stuff Fibre, winner of the Broadband Compare Award for Best Fibre Broadband Provider in 2018. Our exclusive Stuff Fibre deal lets you get THREE MONTHS FREE Fibre Broadband if you sign up for a 12 month contract term. This offer is only available to new customers to Stuff Fibre who sign up from 21 January 2019 on a 12 month contract term through Broadband Compare. If you sign up for a 12 month contract term you will receive your first three months of Fibre base services for free, which will be applied as a credit for your Fibre Base services on your invoice. If your Fibre base service is cancelled prior to the expiry of the contract term then our standard exit fees apply. For a “12 Month Term” an Exit Fee of $99 applies.